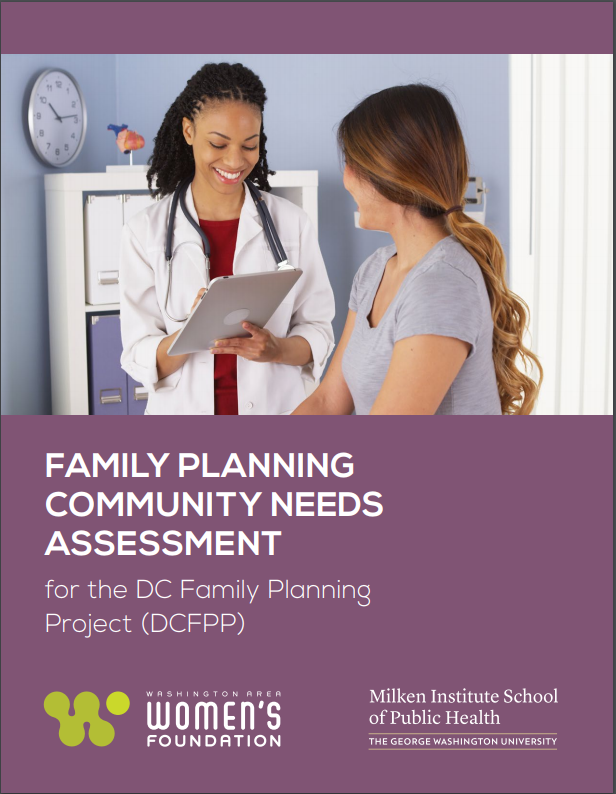 The George Washington University Milken Institute School of Public Health (GW), with support from The Alexander and Margaret Stewart Trust and Washington Area Women’s Foundation, conducted a community needs assessment for the DC Family Planning Project (DCFPP) aimed at providing an in-depth analysis of the family planning landscape for women aged 15–29 in DC. This comprehensive community assessment, which includes both primary and secondary data, was designed, implemented, and analyzed between July 2017 and May 2018. Nationwide, the rate of unintended pregnancy, defined as those pregnancies that are mistimed or unwanted, is one of the highest in the developed world. Although the unintended pregnancy rate has been declining nationally and locally in recent years in the general population, disparities remain – particularly in the District of Columbia. Poor and low-income women continue to bear the brunt of this disparity. Access to family planning services, including both privately and publicly funded services is one necessary component to reducing unintended pregnancies, and more importantly, to ensuring women and families in DC have the ability to plan if and when to have a child. At The Women’s Foundation, we won’t rest until all women, especially young women and girls of color, have equal access to economic security, safety and opportunity, which is why the Family Planning Community Needs Assessment report is important. which influence many women’s decisions regarding contraceptive methods. The DCFPP, housed at The Women’s Foundation, will use the results of this needs assessment, along with the input of the DCFPP Community Advisory Board to develop interventions to reduce reproductive health disparities and improve reproductive health outcomes in DC. To find out more, click here to read the full report!